The Stryker Brigade Combat Team uses the MGS to create openings in walls, destroy bunkers and machine gun nests, and defeat sniper positions and light armor threats. The primary weapon systems are designed to be effective against a range of threats up to T-62 tanks. The MGS operates as a three-vehicle platoon organic to the Stryker infantry company or as a single vehicle in support of a Stryker infantry platoon. The two variant of the LAV III that were produced for the Interim Armored Vehicle program are the Infantry Carrier Vehicle and the Mobile Gun System. 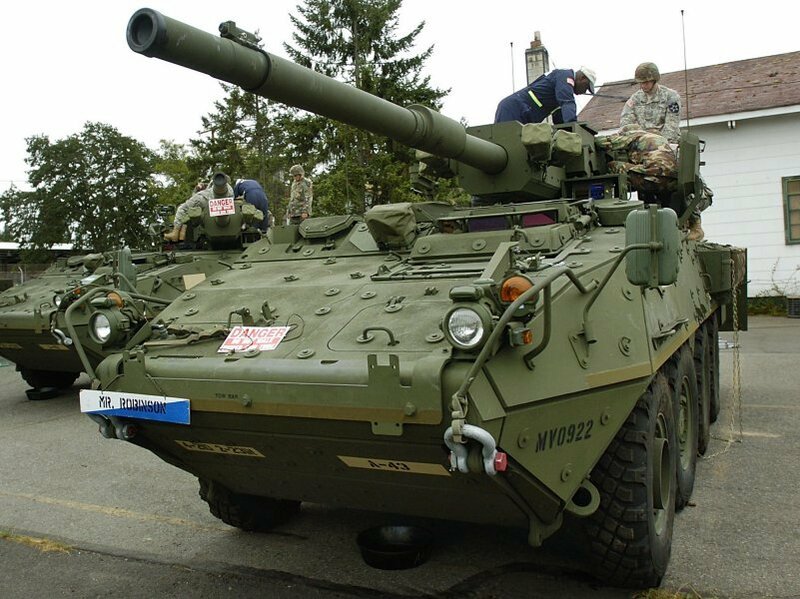 The Stryker Mobile Gun System carries a 105mm cannon, the same gun tube as the one on the original M-1 Abrams tank. This is not a tank replacement, but it gives a direct fire capability to support the infantry elements. The principal function of the Mobile Gun System (MGS) is to provide rapid and lethal direct fires to support assaulting infantry. The MGS is a key weapons overmatch platform to ensure mission success and survivability of the Combined Arms Company. Successful decisive combat operations are characterized by the application of overwhelming precision firepower in a killing zone while countering the enemy's ability to effectively return fire. The IBCT's Combined Arms Company operations are conducted in a collective synchronization of overmatching firepower to ensure success. The MGS is essential in setting and maintaining the tactical conditions for this collective overmatch by providing the capability to rapidly and in succession engage and destroy a diversity of stationary and mobile threat personnel, infrastructure, and materiel targets. It will have the capability to apply a broad spectrum of munitions with lethal effects under all weather and visibility conditions. In applying lethal effects as part of the Combined Arms Company, the MGS will survive on the battlefield by taking advantage of the high levels of threat and situational understanding resident in the Brigade formation. It will engage enemy positions and targets as part of the Combined Arms Company from ranges and locations outside the enemy's kill zone capability. It will avoid high risk terrain profiles. Its inherent mobility and agility will enable it to deliver precision fires from alternate and successive positions outside the enemy's acquisition and fire delivery reaction time. The Mobile Gun System configuration carries a General Dynamics 105mm tank cannon in a low-profile, fully stabilized, "shoot on the move" turret. Its armor protects the three-soldier crew from machine gun bullets, mortar and artillery fragments on the battlefield. The Stryker Mobile Gun System can fire 18 rounds of 105-mm main gun ammunition; 400 rounds of .50 caliber ammunition; and 3,400 rounds of 7.62-mm ammunition. It operates with the latest C4ISR equipment as well as detectors for nuclear, biological and chemical weapons. The Stryker Mobile Gun System [MGS] will employ four types of 105mm tactical ammunition. High explosive/high explosive plastic (HE/HEP) ammunition will destroy hardened enemy bunkers, machinegun and sniper positions, and create openings in walls through which infantry can pass. Kinetic energy (KE) ammunition will be employed to destroy a variety of Level II armored vehicles. High explosive, anti-tank (HEAT) ammunition is well suited to defeat a variety ofthin-skinned vehicles and provide fragmentation effects. Finally, anti-personnel (canister) ammunition will defeat attacking dismounted infantry in the open. HE/HEP, KE and HEAT each have or will have complementary training ammunition. In January 2002 the US Army awarded GM GDLS Defense Group, a joint venture between General Motors and General Dynamics Land Systems, a delivery order worth $48 million for 10 Mobile Gun System vehicles to equip its new Brigade Combat Teams. These mobile gun systems were to be delivered monthly from July 2002 to January 2003 at General Dynamics Anniston (Ala.) facility. 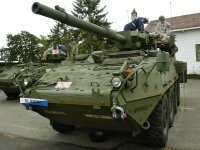 General Dynamics delivered the first of eight pre-production Stryker Mobile Gun Systems to the US Army on 26 July 2002. The pre-production Stryker Mobile Gun Systems are being assembled in the General Dynamics Muskegon technology center through December, using $62 million in research and development funds of the $4 billion contact. Production of an additional 72 mobile gun variants begins in 2003 at General Dynamics Anniston, Alabama, facility. The Stryker vehicles are designed not to exceed a 38,000-pound weight limit, to enable them to fly on a C-130. As of early 2002 the mobile gun exceeded the maximum by 3,000 pounds. The mobile gun system had weighed 45,000 pounds until an aggressive weight reduction program began in January 2002. The effects of this problem are apparent in the composition of the MGS Platoon (Mobile Gun System.) FM 7-22 lays out the MGS PLT as an organic element of each IBCT Infantry Company within the IBCT BN. Each Company Commander has at his disposal within the MGS PLT 3 MGS Strykers, with the mission of supporting the dismounted Infantry with direct, supporting fires IOT destroy hardened enemy bunkers, machine guns, and sniper positions. The MGS Stryker is armed with a 105mm Low Profile Turret capable of a 6 second cycle rate and 18 ready rounds. Apparently, the MGS is a popular system and will be a tremendous asset to the IBCT Company Commander. Similar to an AT Platoon attached to an Airborne Infantry Company; the MGS PLT will provide the lighter armed Strykers and dismounts with outstanding firepower. The armor protection creates a contradiction for the MGS Stryker. Currently, the MGS is fielded with armor protection capable of .50 cal munitions. The add-on scaleable armor in development promises protection against 14.5mm and hand-held HEAT up to and including RPG-7 penetration. The obvious rationale for the developmental armor is the precise evaluation of MG and ATGM threat during support to infantry assault operations. Emerging technology finds itself between a rock and a hard place when faced with the MGS platform. Armor already in use on tanks can stop ATGM, but is too heavy for the air-mobile MGS. Developmental reactive armor must meet the cost, weight, size, and soldier-proof requirements established for the MGS Stryker. Caught in-between the weight restrictions and the desire to protect against ATGM threats on the future battlefield, the MGS is suffering an identity crisis. The stryker makes no attempt to perform in ways it is not capable of; it embraces it's light-skinned composition, and uses it's reduced weight and speed to fight as a faster, more agile force on the battlefield. The MGS, with it's tank-like 105mm top, wants the best of both worlds with the speed of the Stryker, and armor resistance of a Bradley. As seen in large cashes seized in Afghanistan, the RPG is a cheap and heavily saturated weapon system available to every possible IBCT opponent in the world. The platoon includes three MGS vehicles, each with a crew of three: VC, gunner, and driver. The platoon leader and platoon sergeant are the VCs for two of the MGS vehicles. United Defense LP objected to the Stryker award decision soon after it was announced, based (they said) on the Army's failure to consider its own requirements, i.e., United Defense LP contended their vehicle was 50% less costly, can be delivered sooner, and that it meets all the Army's performance specifications unlike the wheeled vehicle selected. They also assert that the competition was pro forma, evidenced by briefing slides prepared before November 2000 that incorporated substitute vehicles for the Mobile Gun System variant. The substitution is significant, posits United Defense LP, because it means that the variant would not be available as required by the timeline specified in the Operational Requirements Document, i.e., the Army was pre-approving a deviation before the contract was awarded. and the delivery schedule was one of the criteria for selecting among manufacturers. With a successful LRIP decision, Stryker brigade first unit equipped date for the MGS was initially scheduled for April 2005. By the FY06 Presidential Budget (PB06) plans called for the capabilities of the SBCTs to be operationally enhanced when the remaining two variants, the Mobile Gun System (MGS) and the NBC Reconnaissance Vehicle (NBCRV) were fielded in FY07 and FY08. However, one year later, in January 2006, plans called for the Mobile Gun System (MGS) and the NBC Reconnaissance Vehicle (NBCRV) to be fielded in FY06 and FY07. A long wait ended for Stryker Mobile Gun System (MGS) crews of the 4th Brigade, 2nd Infantry Division. The 2nd Battalion, 23rd Infantry, received its complement of MGS vehicles in July 2006 after more than a year of waiting. They were the first vehicles to be fielded in the Army. Once the 4th Bde. completes training, instructors from General Dynamics Land Systems will move on to equip and train Soldiers in Hawaii and Pennsylvania. Training for those units may change according to lessons learned here, but the vehicle itself is expected to remain mostly unchanged. On December 14, 2005 General Dynamics Land Systems delivered the first two of 72 low-rate initial production (LRIP) Stryker Mobile Gun System (MGS) variant vehicles to the U.S. Army at Anniston (Ala.) Army Depot. The MGS LRIP vehicles will be used for various tests and user evaluations through the fourth quarter of 2007. The Milestone C decision to begin full-rate production of the MGS variant is slated for the fourth quarter of 2007 as well. GM GDLS Defense Group L.L.C. (Joint Venture), Sterling Heights, Mich., was awarded on Aug. 25, 2006, a delivery order amount of $25,000,000 as part of a $194,083,293 cost-plus-fixed-fee contract for the mobile gun system vehicle and nuclear biological chemical reconnaissance vehicle test support. Work would be performed in Sterling Heights, Mich. (80 percent), and London Ontario, Canada (20 percent), and is expected to be completed by Oct. 31, 2007. Contract funds would not expire at the end of the current fiscal year. There were an unknown number of bids solicited via the World Wide Web on April 6, 2000, and 17 bids were received. The U.S. Army Tank-Automotive and Armaments Command, Warren, Mich., was the contracting activity (DAAE07-00-D-M051). In the 2007 Beyond Low-Rate Initial Production Report, DOT&E assessed the MGS as not operationally effective when operating in a degraded capacity. DOT&E assesses that the gun pod can be easily disabled, causing the MGS to operate in a degraded capacity, thereby making the MGS not operationally effective. Lack of adequate gun pod protection makes the MGS vulnerable to widely proliferated threats including RPGs, which increases the likelihood of the MGS operating in a degraded capacity. The Army had no plans to improve gun pod protection. During the December 2010 Stryker DVH Configuration Steering Board, the Army decided not to pursue full-rate production for the Stryker flat-bottom MGS. The Army determined it could not integrate the DVH design onto the MGS platform unless the Stryker Modernization program occurred to accommodate weight and power deficiencies. The MGS demonstrated Mission Equipment Package reliability during the August 2011 Reliability Gunnery. Overall, the program has mitigated (by either material fixes or changes to tactics, techniques, and procedures) 17 of the 23 deficiencies identified in the 2008 Secretary of Defense Report to Congress. Although all of the deficiencies the Army associated with the operational requirements document have been mitigated, DOT&E considered correction of two of the outstanding deficiencies – lack of gun pod protection and RPG protection – to be essential to ensure the operational effectiveness of the MGS in combat situations such as those that exist in the current theater of operations. The C-130 Transportability Key Performance Parameter is a design constraint that limits MGS capabilities. Because of size and weight constraints for transporting equipment on the C-130, there is a limitation on the size and weight of the MGS. This limit results in several survivability deficiencies, including protection of the Commander’s Weapon Station, protection of 105 mm ammunition, gun pod protection, and hydraulic circuit separation. These deficiencies would potentially be addressed as part of the Stryker Modernization Program, if this program moves forward. A total of 142 MGSs have been produced and fielded.